At least four people have been killed and more than 20 wounded in an explosion in the southern city of Kandahar, Afghan officials say. At the time of the blast, the market was packed with shoppers ahead of the Eid holiday, an official told the BBC. The bomb was hidden in a cart, said a spokesman for the governor of the province. Violence in Afghanistan has increased ahead of the planned withdrawal of international forces next year. 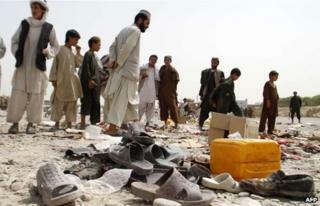 Officials confirmed that all four killed in Kandahar City were civilians. It was not clear what the bomb was targeting. No group has said it carried out the attack. Insurgents have been trying to take advantage of the transfer of security responsibility from foreign to Afghan forces as the international coalition withdraws from Afghanistan. Last week, the UN reported that civilian casualties had risen dramatically in the first six months of the year.